Bishop Miege travels to rival Blue Valley in a key game among two of the top teams in the Eastern Kansas League. Miege will look to rebound from last week’s 14-13 loss to Rockhurst (Mo.) which ended the Stags’ 29-game losing streak. Prior to last week, the last time Bishop Miege lost a game was in the 2016 season-opener to these Blue Valley Tigers. In fact, Blue Valley had beaten Miege two straight times before the Stags rolled past the Tigers 55-10 in last season’s opener. Last Week, the Stags trailed 14-0 in the third quarter before the Stags scored on a pass from TyQuez Agnew-Whitten to Sam Powell to cut the lead in half. In the middle of the fourth quarter, quarterback Sam Pedrotti hit Hudson Bentley on a 22-yard touchdown pass on fourth-and-13 to pull Miege within 14-13. The Stags then tried to fake the PAT for to take the lead on a two-point conversion, but Pedrotti, who doubles as the Miege kicker, was tripped up and stopped short. For the season, Pedrotti has passed for 839 yards and six touchdowns. Sophomore standout Phillippe Wesley has taken over as the primary receiver since all-stater Daniel Jackson went down with an injury in Week 1. Wesley has 20 receptions for 408 yards and three touchdowns, while Bentley has 23 catches for 315 yards. The Stags have kept things on the ground where junior Brison Cobbins leads the team with 550 yards rushing and ten scores. Defensively, all-state linebacker Dylan Downing leads the team with 46 stops, including six for loss. Blue Valley also has a loss to Rockhurst, 49-7, two weeks ago. The Tigers also dropped their season-opener to St. Thomas Aquinas, 30-14. Blue Valley is led by senior quarterback Walker Kinney, who has passed for 1,181 yards and 13 touchdowns this season. Cameron Green leads a group of three receivers with at least 12 catches. Green has 20 receptions for 427 yards and six scores, while Dorian Stephens and Nash Sloan also have double-digit receptions. The Tiger run game is searching for some answers as five to six different backs have carried the ball in the past few weeks due to injury. Kinney has by far the most rushing attempts for Blue Valley this season as leading rusher Eric Olson hasn’t played since a Week 2 win over Blue Valley North. Kinney will have to have a great game for Blue Valley and the Tigers will have to limit mistakes in order to take down the Stags. The Holy War is annually one of the City League, Class 5A and the state’s biggest games. Bishop Carroll is 3-2 against a highly challenging schedule, while Kapaun Mt. Carmel stands at 4-1. This year’s contest is at Wichita State University’s Cessna Stadium. Carroll has won every meeting since 1999. Last year in the regular season, the Golden Eagles rallied from a 13-point deficit in the first half to win 30-22. In the playoffs, Carroll beat Kapaun, 41-6. The teams have matched up in the regular season and playoffs each of the last two falls. In Week 1, Carroll fell 23-22 to Wichita Northwest in a last-second field goal. The following week, the Golden Eagles defeated Wichita Heights, 36-20. After a 49-20 win versus Wichita West, Carroll lost, 24-6, to Derby and came back to defeat Great Bend, 36-33, on the road. Carroll has battled injuries to quarterback Cade Becker, including last week. Last week, Bishop Carroll scored twice late, and then Great Bend had first-and-goal and a chance to win the game. The Golden Eagles’ defense stiffened, and kept the Panthers out of the end zone. Great Bend missed a last-second field goal, and Carroll held on for a victory. Brady Bockover scored the game-winning touchdown with 2:11 left on a 1-yard run. Great Bend led 33-21 with 11:05 remaining before the Golden Eagles started their comeback. Backup quarterback Aiden Niedens propelled the offense with drives of 69 and 45 yards. Gunner Lynch caught a 10-yard touchdown pass. Additionally, Jackson Nichols rushed for a score, and Bockover and Niedens tallied TDs in the first half. Nichols has enjoyed a nice season and finished with 23 carries for 151 yards, while Niedens had 16 carries for 92 yards. Niedens completed 8 of 15 passes for 126 yards. Tight end Clay Cundiff, a Kansas commit, had two catches for 36 yards. Kapaun, propelled by its defense, opened with four straight victories. The Crusaders collectively permitted three points in the first three week, then won at Andover, 33-26, two weeks ago. The schedule progressively gets harder with Wichita Northwest (55-26 loss) last week, followed by Carroll, at St. James Academy and at Wichita Heights. Kapaun has passed for 126 yards a contest and rushed for 141 yards a game. Two quarterbacks, junior Jarius Kennedy and senior Jack Hacking, have split time and combined for 42 of 87 passing for 615 yards with a 7/2 TD/INT ratio. Kennedy threw for 178 yards with a 3/1 TD/INT ratio and a long of 70 yards versus Northwest. Senior Scott Valentas, a Columbia (N.Y.) University commit, has 84 carries for 387 yards and eight rushing scores. Kapaun has averaged 3.3 yards a rush, including 2.8 yards a carry last week. Northwest rolled up 539 yards of offense and had three players clear 100 yards rushing. While Kapaun keeps this close, Carroll’s offensive weapons provide another Holy War win. A key matchup in the Hi-Plains League and a game that will likely decide the top-two spots in Class 2A, District 7. Cimarron has captured four straight in the series and five of the last six. The last three matchups have been 44-0, 36-14 and 32-8. Both coaches have enjoyed winning at their new school after a run of success at a previous program. Cimarron’s Greg Koenig did well at Beloit, including a state runner-up finish. Lakin’s Chris Bamberger won a state title at Ness City. Cimarron, in Koenig’s second season, lost 27-20 at Elkhart in the season opener that was called early in the fourth quarter due to weather. Since then, the Bluejays have reeled off four straight victories with three straight home contests against Meade (44-6), Stanton County (66-8), Southwestern Heights (58-12), and at Sterling (74-19) last week. Cimarron has averaged 376 rushing yards a contest, along with 80 passing yards a game. The Bluejays rank second in the state in 11-man rushing per game, according to MaxPreps. Two quarterbacks have combined for an 8/0 TD/INT ratio, with senior Dylan Harrison the starter. He has completed 20 of 38 passes for 354 yards with six scores against no interceptions. Sophomore Tate Seabolt has 103 carries for 789 yards and nine scores. Senior Anthony Erives has averaged 11.1 yards a carry for 499 yards and five TDs. Erives had a breakout game versus Sterling with 15 carries for 249 yards and four scores. Cimarron finished with 618 total yards in the win. Erives also leads the team in receptions (seven) and receiving yards (119) with a score. Cimarron has struggled with fumbling (nine lost) and is minus-2 in turnover margin. Four of the top-five tacklers are seniors, led by 41 stops from Tanner Dewey. Cimarron has 14 seniors. Lakin continues to turnaround under Bamberger, in his fourth year. The Broncs are 2-7, 5-5, 7-3 and 5-0 with Bamberger. The Broncs opened with a 20-19 road win against Meade, and then won 40-14 at Stanton County. After home wins versus Syracuse (28-0) and Ellinwood (47-0), the Broncs won at Southwestern Heights, 28-6, last Friday. The Broncs have averaged 226 rushing and 17 passing yards a contest. Junior Kayden Christiansen has 92 carries for 646 yards and 10 scores. Lakin has delivered 6.4 yards a carry behind a line that features standout junior Hadley Panzer. Junior Erik Moreno and sophomore Dawson Aller were also returning starters up front. Quarterback Juan Banuelos is the team’s only returning senior starter. Lakin lists nine seniors on its 40-player roster. All receiving yards come from non-seniors and 77 percent of the rushing yards come from non-seniors. Eight of the top-nine tacklers are non-seniors, though senior Logan Gugelmeyer and Christiansen tie for the team-high with 36 stops. Lakin has forced eight turnovers and is even in turnover margin. Both teams have a great running back, and Panzer is an excellent blocker. However, Cimarron has a stronger passing game, a better secondary option with Erives, more seniors in key roles and been more dominant against common opponents. Troy hosts fifth-ranked Jackson Heights in game featuring a pair of contenders on the east side of Class 1A. Friday’s game between the Trojans and Cobras will likely decide the top two playoff spots in District 3, which also includes traditional playoff participants Jefferson County North and Lyndon. Troy has dropped two straight games since a 3-0 start that included quality wins over Valley Heights (27-12) and Pleasant Ridge (18-0). Those losses have come against good teams in Christ Prep Academy (5-1) and No. 4 Centralia (3-2). Against Christ Prep, Troy led 13-12 into the fourth quarter before the Patriots converted a short field into a touchdown and two-point conversion to lead 20-13. Troy later scored, but was unable to convert the PAT to tie the game. Last week against Centralia, the Trojans again held a one-point lead, 22-21, until late in the game when Centralia scored twice in the closing minutes by virtue of a touchdown, an interception, and a long touchdown run. Junior quarterback Kipp Jasper is among the Class 1A passing leaders with 726 yards this season. Jasper is over halfway to his sophomore total of 1,350 a season ago. Reid Jasper is his top receiving target, having hauled in 365 yards in the Trojans’ first five games. On the other side, Jackson Heights posted three consecutive shutouts to open the season before falling to No. 2 Olpe, 20-18 in Week 2. The Cobras failed to convert two-point attempts following all three touchdowns in the loss to the Eagles. The Cobras then rebounded last week with a late touchdown to beat Valley Heights, 22-14. The game was tied at 14 until under a minute to go when Kolby Rethman scored from 2 yards out on a fourth-down play to put the Cobras on top. Cooper Williams leads the Cobra offense with 710 rushing yards through five games. Rethman and Conlan Bruggeman also provide solid options out of the Jackson Heights’ backfield along with quarterback Cable Wareham. Jackson Heights features a big offensive line led by junior Carson Williams (6-2, 225) that gained a lot of experience last season playing as underclassmen. These two teams haven’t met since 2013 when Troy won 18-12 in overtime. In fact, Troy has won the past four meetings, although that six-point overtime win was the largest margin of victory. Troy also won 8-6 in 2012 and 14-12 in 2011. We expect another close game on Friday night that could go either way. A marquee matchup that will shape District 8 and the western side of Eight-Man, Division I. St. Francis, with first-year coach Nick Fawcett, a former Hays High assistant, has started 5-0, 2-0 in district play. 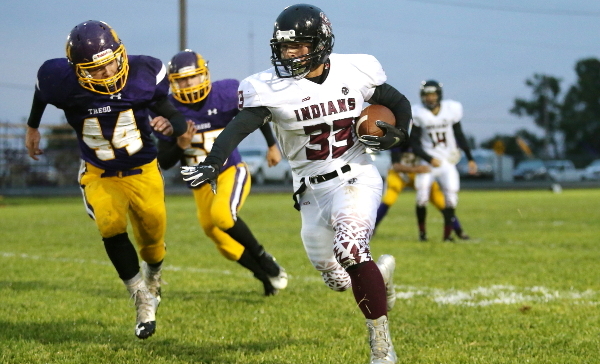 Last week, the Indians defeated rival Hoxie, the defending state champion and ranked first in the classification. Hoxie scored on the game’s first offensive play on a fumble recovery for a touchdown. Then, St. Francis, led by its new single wing offense, went on a 50-8 run and won 64-30. Hoxie is 16-2 in the last two seasons with both losses to St. Francis. St. Francis dropped one regular season game from ’15-17 under former coach Rodney Yates, now at Cambridge (Neb.). The Indians had turmoil last fall with multiple reserves leaving the team. Sainty went 7-2 and finished the season with just 13 players. The 2018 Indians had just two returning starters, standout tailback Jordan Raby and quarterback Brady Dinkel. Both started in ’16 when St. Francis earned state runner-up. Fawcett, an assistant at several places, learned about the Indians from former Hays High coach Randall Rath, a St. Francis alum. Fawcett said several St. Francis players told him they had lost their love for football after last fall. Currently, St. Francis has 24 players. Fawcett has used slogans of “we are going to make football fun” and “keep chopping.” After a tight performance versus Oberlin two weeks ago, Fawcett held a team meeting. He wanted the kids to enjoy the game like they did when they were youngsters and play worry-free. Fawcett believed that occurred against Hoxie. The emotions and team mottos helped overcome the early turnover. Up front, sophomore Jesse Baxter starts at left guard and sophomore Colton Neitzel is at center. Both players had never played varsity before this year. Senior Hunter Helton starts at right guard. He had played limited snaps in past years because of injuries. Neitzel weighs 230 pounds, while Baxter is at 205, the team’s two biggest players. Raby, an elite sprinter from track, is third in eight-man with 800 rushing yards as St. Francis has averaged 318 rushing yards a game. In the single wing, St. Francis has direct snapped to Raby and Dinkel. For two-point conversions, the Indians bring in a new backfield with sophomores Shadryon Blanka – also a starting linebacker – and Adam Krien. Senior Connor Keller, who didn’t play any in ’17, has been some in the backfield, too. Senior Cody Baxter delivered multiple big catches versus Hoxie. Senior Richard Johnson, who has never played before, is 6-4, 205 and starts at tight end. Raby, Dinkel, Blanka, Krien and Keller are the only players back from last year. Leoti-Wichita County (4-1, 1-1) has enjoyed its best start in at least 14 years with first-year coach Brant Douglas. Leoti opened with three big victories before it played Hoxie close well into the second half in a 36-20 road loss. Similar to St. Francis last week, Leoti had a massive run of points. Leoti led WaKeeney-Trego 8-6 at the end of the first quarter before 50 second-quarter points and an eventual 58-12 road win in a game that ended at halftime. The Indians have a massive offensive line that has played well. Three seniors start up front with Jesse Hermosillo, Blake Hernandez and Oscar Jiminez, along with sophomore AC Hermosillo. The close-knit quartet weighs between 215 and 275 pounds. They helped sophomore quarterback Kayde Rietzke and sophomore running back Jesse Gardner each account for more than 180 yards last Friday. Rietzke went out with a stinger for precautionary reasons against the Golden Eagles but is expected to play this week. Rietzke missed last season with injury and has played very well since he returned. He has completed 76 percent of his passes for 644 yards and a 12/4 TD/INT ratio. Known for his speed, he has 58 carries for 487 yards and 12 scores. Gardner has averaged 8.7 yards a carry for 331 rushing yards and six scores. Gardner, senior Ronald Michel and Jesse Hermosillo are the top-three tacklers. Hermosillo has been dominant at defensive tackle with four tackles for loss. Last week, he set up a key score with a TFL, forced fumble and fumble recovery all on the same play. After last Friday’s game, Hermosillo didn’t want Leoti to just be viewed as a surprise, but as a contending team in the classification. Similar to Hoxie, St. Francis and Atwood all finishing at least 7-1 or better last year and going 1-1 against each other in district play last fall, Leoti has a great opportunity to make this a three-team race, but has to break a long losing streak versus St. Francis. From ’01-13, St. Francis is 11-0 against Leoti. This should be an excellent game and should come down to two key factors: how St. Francis’ relatively inexperienced line does against Leoti’s sizable front, and how Leoti slows down Raby and the explosive single wing. Three Twin Valley League teams, Hanover, Axtell and Frankfort, all stand at 5-0. Frankfort is 4-0 in District 3, while Axtell and Hanover are 3-0. This is the opening matchup between a three-week race that is expected to decide the top-three district spots. Since ’04, Hanover is 12-1 against Axtell with 11 straight victories dating back to ’05. Hanover has captured 30 straight wins after 12-0 and 13-0 seasons the last two years. Axtell went 4-5 and 6-4 the last two seasons and is on pace for its best year since a 10-2 mark in ’15. Axtell has enjoyed a great combination of quarterback Quinn Buessing and wide receiver Hunter Koch. Buessing has completed 72 of 101 passes for 1,038 yards with 29 scores against zero interceptions. Axtell has rushed for just 444 yards but has averaged 6.9 yards per carry. Koch has 37 catches for 627 yards and 20 scores. Defensively, senior Nate Buessing leads with 35 tackles, 7.5 for loss. Senior Tristan Dekoning has six TFLs. Axtell has just 17 players on the roster with five seniors. Sophomore Kolby Talbot (225 pounds) and Dekoning are the only players above 180 pounds. Hanover has not lost a regular season game since a 34-22 defeat to Baileyville B&B in Week 8 of 2013. The Wildcats have outscored teams 233-6 and easily pace the classification in scoring defense. Axtell is second in offense with 284 points. Hanover counters with 26 players with seven seniors. Senior quarterback Daiken Stallbaumer has earned all-state honors the last two seasons, while senior running back Carter Bruna was an all-state pick last year. Senior Thomas Atkins is an electrifying playmaker. Hanover has significant size with five players at least 195 pounds, led by junior lineman Jonah Weber (6-4, 250). Since the start of the ’14 season, Hanover has rarely been challenged and only lost twice, in the state title game in ’14 to Central Plains and ’15 to Spearville. Last year, the Wildcats faced tough games versus Rock Hills, Pike Valley and Hodgeman County in the playoffs. All five of those teams had multiple elite playmakers on offense, especially with Hodgeman County in the passing game in last year’s state title. However, teams traditionally have trouble matching up with Hanover’s waves of depth and athleticism for four quarters.